We’re super proud to say that The Unfinished Swan is complete and as of today is available for Playstation Plus subscribers! If you’ve got PS+, you can download it a week early. The rest of PSN can download it next week on October 23rd. Between you and me, Playstation Plus is a pretty great deal. Now you’re not allowed to make that joke any more! First up, Sony’s posted another excellent developer diary for The Unfinished Swan. This one is about the music in the game, and it features composure Joel Corelitz talking about how he breathed life into the musical world of Swan. Joel works under the name waveplant, and you can find more of his work at waveplantstudios.com. Second, Ben wrote another post for the PlayStation Blog called “The Unfinished Swan: 10 Things You Need to Know,” it’s got some surprises and nifty details (but no spoilers). Fourth and finally, we’ve thrown up some pictures of our Indiecade trip on Imgur, check out the album and see which splats we gave away. Also the luscious hair portrait I got with John Romero. Release Date(s)! Indiecade! Poster Giveaway! Developer Diary! My Bursting Heart! True Believers, bear with me as I enthusiastically hammer this post out in my rush to physically be at Indiecade, rather than writing about it. Everything that we could possibly desire to have happen is happening this week! First, as of 6 AM this morning, Sony has lifted the press embargo on our release date. The Unfinished Swan will be available for download on PSN on October 23rd. PlayStation Plus subscribers can get the game a week early, on October 16th. Sony even has a store page primed and ready! We will be stopping by over the course of the weekend– consider this our “home base” at Indiecade. This will also be the location of our giveaway, which brings me to my next point! Indiecade would not be complete without swag schwag presents. If you remember way back in 2009, we spent a morning throwing a bunch of paint around an undisclosed location. That was only the first time we did that. At a later date, with great experimental rigor, we decamped to another secret location and dropped paint onto a series of poster boards, in effect creating giant slides of reference splats. These slides were later photographed, scanned, and used as source material for the splats in the game throughout Unfinished Swan‘s development. 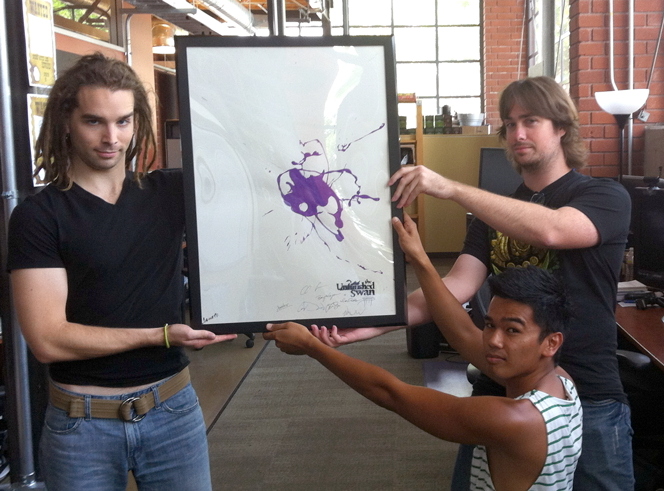 A very limited number of these survived, and we’ve turned them into signed and framed posters (see above). We’ll be giving one away every half hour to the first person who tells us the day’s pass phrase that we announce on twitter through the @GiantSparrow account. Thank you to the handsome and talented Joshua Beeler, Cory Davis, and Julius Edraisa for modeling the poster for us. That’s all for now, we hope to see you at Indiecade! I lied. That was not all. I almost forgot that Giant Sparrow’s level designer extraordinaire, Benjamin Esposito (@torahhorse), has a personal game at Indiecade. He’ll be showing his game, Kachina, in the firestation (edit: Ben’s actually showing Kachina with the other games by the main checkin area) with all the other Official Selections. Check it out!